Although they are usually a mute animal and very rarely ever heard, giraffes do in fact make noises. 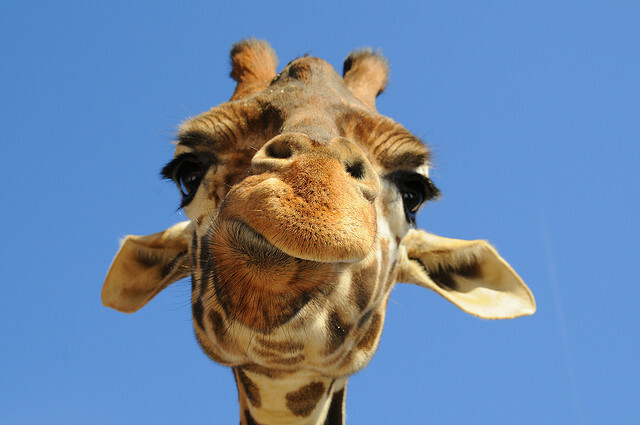 Giraffes communicate with one another by infrasonic sound. They do, at time, vocalize to one another by grunts or whistle-like cries. They also communicate by moaning, snoring, hissing, and flutelike sounds. When alarmed, a giraffe grunts or snorts to warn neighboring giraffes of the danger. Mother giraffes can whistle to their young calves. Also, cows search for their lost young by making bellowing calls. The calves return to their mother’s calls by bleating or mewing. While courting an estrous cow, male giraffes may cough raucously. So you see they do, in fact, make quite a few different types of noises but are very seldom heard making them. Maisano, Sarah. “ADW: Giraffa Camelopardalis.” Animal Diversity Web. 8 Feb. 2012. Web. 8 Feb 2012. Next Next post: The Hunger Games: Was the movie worthy of the book?